Call of Duty: Modern Warfare 2 (previously marketed as simply Modern Warfare 2) is a first-person shooter video game developed by Infinity Ward and published by Activision for Microsoft Windows, PlayStation 3, and Xbox 360. Officially announced on February 11, 2009, the game was released worldwide on November 10, 2009. It is the sixth installment of the Call of Duty series, and the direct sequel to Call of Duty 4: Modern Warfare, continuing along the same storyline. During the single player campaign, the player takes on the role of Sergeant Gary "Roach" Sanderson, a member of an elite, multinational commando unit known as Task Force 141. The player character in Call of Duty 4, Sergeant "Soap" MacTavish, returns as a non-playable character; promoted to captain in the Special Air Service, MacTavish is now the head of the Task Force and Sanderson's superior officer. A third member of the Task Force is Ghost, a mysterious character who conceals his face with a skull-imprinted balaclava. 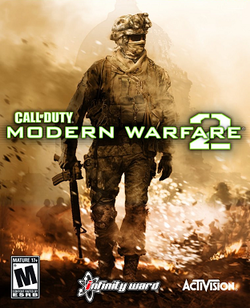 Modern Warfare 2 is set several years after the conclusion of Call of Duty 4. The radical Russian Ultranationalist organization has returned to prominence under the leadership of Vladimir Makarov, a former associate of Imran Zakhaev with his own ambitions. Makarov has publicized Zakhaev's death as an act of martyrdom to garner support for his cause, enabling him to build a strong power base in Russia over the years. Fearful of Makarov's growing influence, the global community established Task Force 141 to counter the threat posed by the resurgent Ultranationalists. This page was last edited on 30 May 2016, at 05:05. This page has been accessed 27,027 times.